Keep calm, spring has arrived- and fun events are sprouting around North Texas all month long! 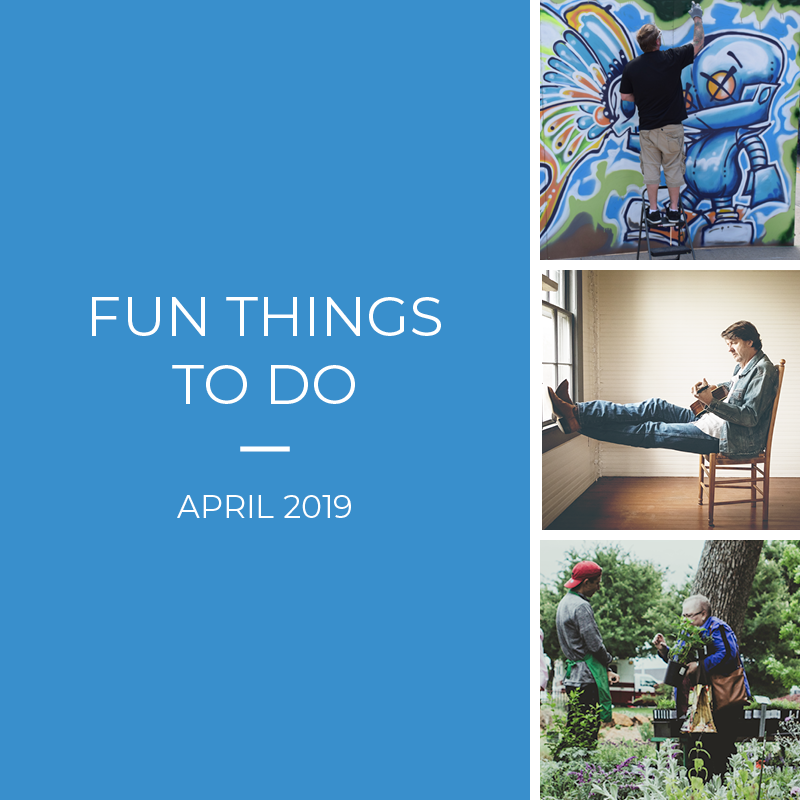 From fun festivals in the springtime air, concerts showcasing music from all over or events that speak to your artistic abilities, you can attend many fun outings in North Texas with our help! Want to get in touch with what’s fresh in Denton? 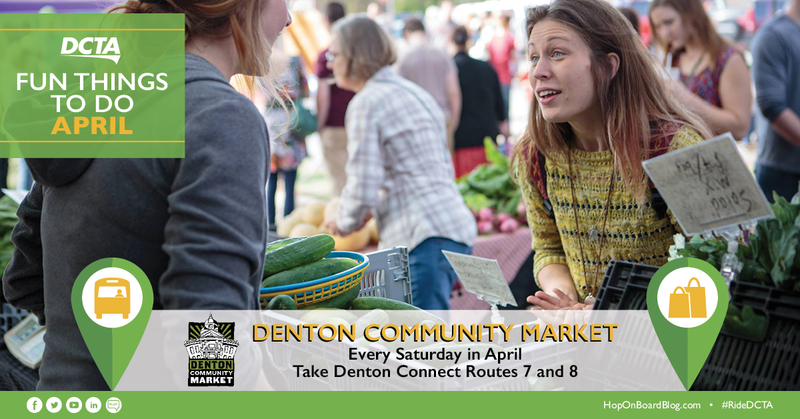 With over 100 local booths, the Denton Community Market offers something for everyone- from art, produce, music and more! Bring your family (pets included) to celebrate the 10th-Year Anniversary of our local art and farmers market on its opening day, Saturday, April 6 from 9 a.m. to 1 p.m. 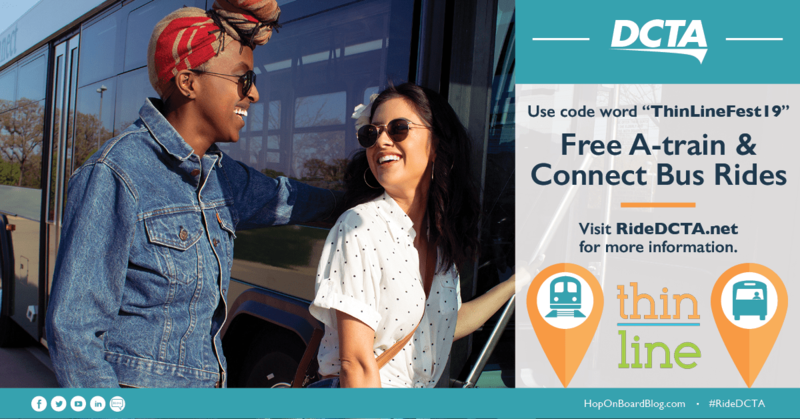 Hop on Denton Connect Routes 7 and 8 and get to supporting Denton businesses! For more information, visit dentoncommunitymarket.com/. 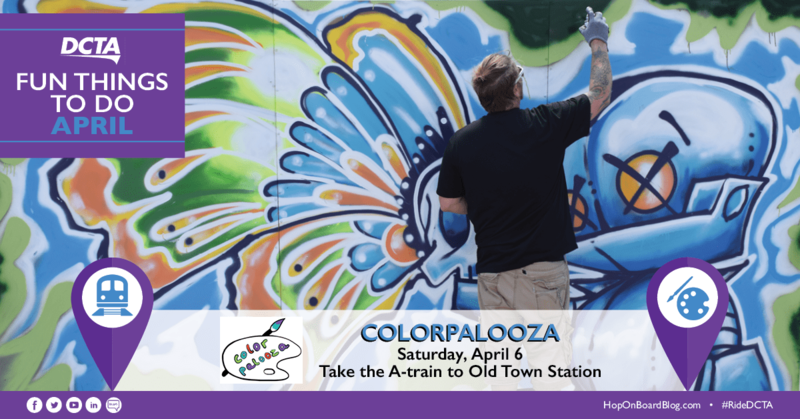 Hop into the colorful spirit of spring and spend a bright time at Lewisville’s Colorpalooza! This FREE event will feature the eco-friendly and artistic character of Lewisville with sidewalk chalk activities, DIY tie-dye, art demonstrations and more! Make plans to attend with your friends and family to enjoy a colorful day on Saturday, April 6, from 10 a.m. to 7 p.m. at Wayne Ferguson Plaza. To get there, take our A-train to Old Town Station or Lewisville Connect Route 22. For more information, visit cityoflewisville.com/about-us/city-departments/community-relations-tourism/special-events-festivals/lewisville-colorpalooza. Please note: DCTA does not operate service on Sundays. 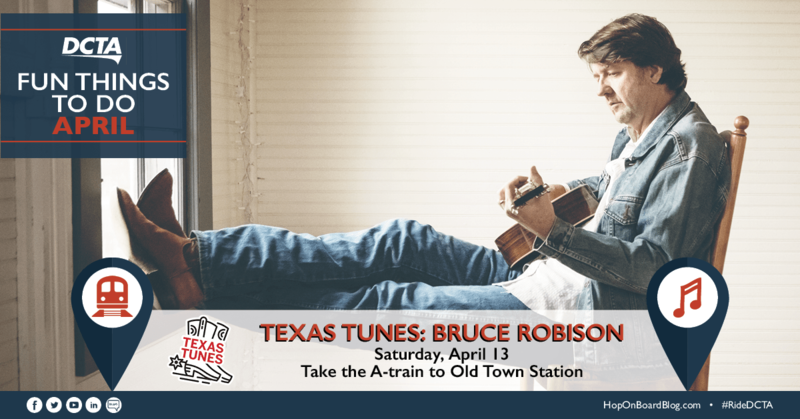 Bruce Robinson, one of the Lone Star State’s most talented songwriters, will perform some of the best of country this month at Texas Tunes at the MCL Grand Theatre in Lewisville. Robinson, an Austin-based tunesmith, will perform a variety of songs he’s written for artists like the Dixie Chick’s, Tim McGraw, and George Strait on Saturday, April 13, at 8 p.m. Tier 1 sears are $30 and Tier 2 seats are $20. Lewisville residents can purchase tickets for a special day-of rate of $15 (based on availability). Ride our A-train to Old Town Station to get to the show. For more information about Texas Tunes, visit mclgrand.com/performances/mcl-grand-presents/texas-tunes. What better time to celebrate Denton’s beauty than this spring? 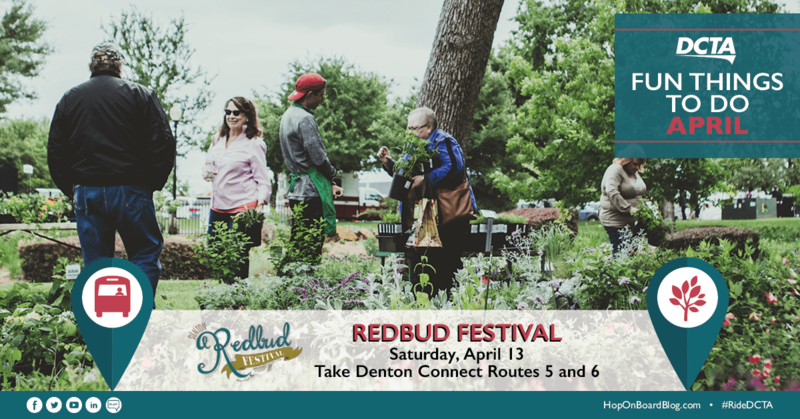 Denton’s Redbud Festival is a great opportunity to support and meet local vendors who sell all-things gardening. From gardening supplies, plants, and other outdoor products, the Redbud Festival is the place to stock up on items to enhance the beauty of your outdoors. The festival will be held on Saturday, April 13, from 10 a.m. to 4 p.m. Ride our Denton Connect Routes 5 and 6 to enjoy a day filled with family-friendly activities, live music, and more than 70 booths at the Denton Civic Center. For more information, visit kdb.org/programs/beautification/denton-redbud-festival/. Grab your lawn chairs, a cozy blanket and some snacks for an afternoon filled with live music in downtown Denton! 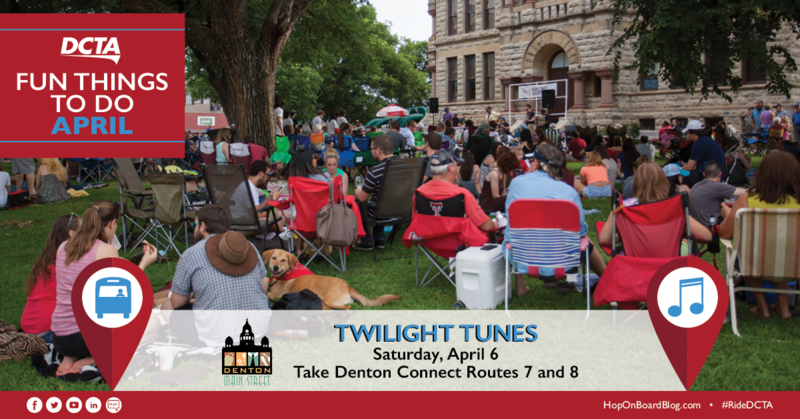 Twilight Tunes, hosted by the Denton Main Street Association, is hosting this FREE concert series every Thursday starting April 18 from 6:30 p.m. to 8 p.m. at the Denton County Courthouse-on-the-Square. This weekly concert series offers music for everyone from pop to rock and everything in between. Ride our Denton Connect Routes 7 and 8 to secure your spot on the lawn and enjoy some tunes in the spring sunset. For the 2019 artist lineup, visit discoverdenton.com/original-event/twilight-tunes-concert-series/. Want to mix it up for your Friday night date plans? Date Night at the Doubletree is a great way to spend time with your significant other, meet new couples and have a unique Friday night experience. Craft night will be hosted at the Doubletree Ranch Park on Friday, April 19 from 7 p.m. to 9 p.m. Registration is $35 per couple and is required to be completed one week prior to the event. 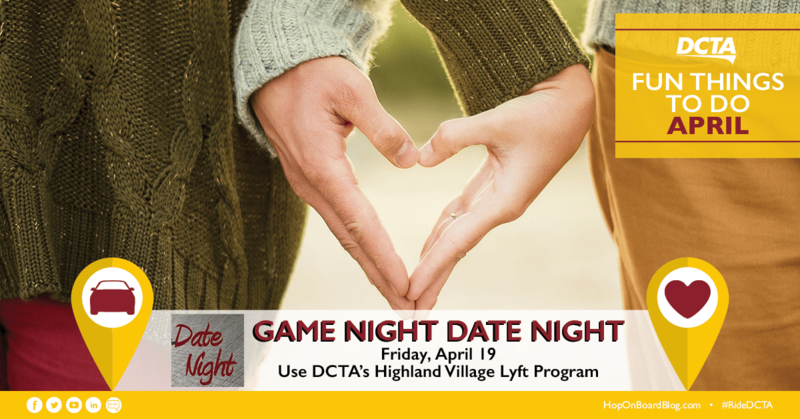 Ride our Highland Village Lyft Program and head over to make crafts for some Friday night fun! For more information, visit highlandvillage.org/988/Date-Night-at-Doubletree. Wondering where you can satisfy three of your five senses at once? The Denton Arts and Jazz Festival is the perfect place to enjoy jazz music, good food, and beautiful art created by people right here in Denton as well as from all around the world. The Denton Arts and Jazz Festival will run on Friday, April 26 (from 3 p.m. to 11 p.m.), Saturday, April 27 (from 10 a.m. to 11 p.m.), and Sunday, April 28 (from 11 a.m. to 9.m.) at Quakertown Park. Whether you want to listen to great music, visit the Percussion Petting Zoo, or eat from any of the six food courts, the Denton Arts and Jazz festival is a great place to spend the weekend with family and friends. Ride our FREE shuttle service each day of the festival from MedPark station directly to the festival grounds. For more information, visit dentonjazzfest.com/. Which events do you plan to attend this month? Let us know in the comment section below!